At Unzen's hot springs, what kind of bath has an effect on what? We will give you tips on Unzen hot springs that you will benefit from knowing. What should you do before getting into the bath? What kind of bathing is good for you? There are two types of hot springs: clear water a wind white-colored water. It has a distinct smell of sulfur. It is very acidic and sour. Originally, Unzen was a region where the word “onsen” was read as “Unzen”. The springs here are very acidic, containing sulfur, forming a hot spring that cannot be found even in Europe, where balneotherapy is common. Within Japan, it is very similar to Kusatsu hot springs. The spring quality features acidic hydrogen sulfide, sulfur-containing acidic hydrogen alum, and iron vitriol springs, and are commonly known as sulfuric springs. Because it is sulfuric, or in other words very acidic, it has a sterilizing effect. It is effective for skin diseases in general, such as rashes, frostbite, and cuts. In addition, it can beautify the skin, and is effective against chronic rheumatism, diabetes, neuralgia, muscle pains, joint pains, fatigue recovery, and is health promoting. We would like to answer questions that are particularly common. Why are the colors of the hot springs different? Depending on the inn, the hot springs will either be clear or murky white. Essentially, sulfur springs are clear. However, when drawn from the Jigoku, mud containing minerals also enter the stream, making the water white and murky. Is the amount of water at Unzen Hot Springs abundant? Unzen Hot Springs is a national park, so drilling is forbidden in order to protect the water. Therefore, the water volume for each inn is limited. The inns have to use their water carefully and adjust the volume of water for each bath accordingly. Natural hot springs are valuable blessings from the Earth. Can anyone bathe in the Unzen Hot Springs? There are ailments that are forbidden. Generally, persons with acute diseases, malignant tumors, severe heart conditions, respiratory insufficiency, renal insufficiency, hemorrhagic diseases, severe anemia, and other ailments in progression, and those with sensitive skin or mucous membranes should avoid bathing. Trivia about famous Hot Springs of Unzen　We will give you tips on Unzen hot spring that you will benefit from knowing. Seasons Good for Healing at Unezn are, 1. Summer 2. Autumn 3. Spring. Balneotherapy at Unzen It is often mistaken that balneotherapy is beneficial by bathing in the hot springs. However, it is effective as a whole by elements such as refreshing changes different from daily life, such as weather, and the surrounding natural environment. To Start Your Day At Unzen, Take A Morning Bath and Start Fresh and Clean! Recommendations for Morning Baths The viscosity of human blood increases during the night, and bathing in hot water can cause blood vessels to clog. In the morning, the viscosity of blood decreases, and is smooth. When you bathe in the hot spring, your blood circulation becomes active, and your body will feel refreshed. Take a morning bath and switch on to active mode. 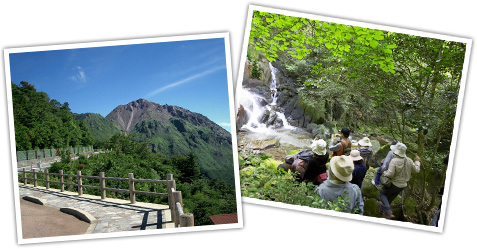 Unzen is a hot spring resort surrounded by abundant nature. During the day, please go outside and actively walk around. Walking in the woods promotes the phytoncide effect (forest bathing) and will relax your soul. Additionally, there is a lot of oxygen being emitted, making it perfect for health promotion. Please sober up before bathing in the hot springs. Bathing after drinking is dangerous. Drinking a lot during dinner, and bathing in the hot springs: It's a common occurrence, but is actually very dangerous. Both alcohol and bathing expand blood vessels and promote blood circulation, making blood that should travel to the brain move toward the surface of the skin, and more likely to cause anemia. Furthermore, because of increased heart rate, arrhythmia and heart attacks become likely as well. Do not drink in the hot spring, either. 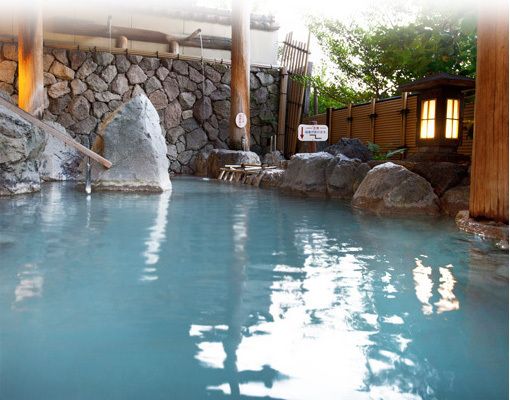 After enjoying the delicacies of Unzen, take a break before bathing in the hot springs. Avoid bathing immediately after eating. When bathing immediately after eating, blood that was supposed to travel to the stomach and intestines travels to the surface of the skin, preventing digestion and absorption. Furthermore, the pressure from the water prevents food from traveling from the stomach to the intestines. Take a break of 30 minutes to an hour and take a lukewarm bath. Depending on the temperature of the water, the effects on the body may differ. Difference between hot and lukewarm water Hot water excites the sympathetic nerves and activates the body. Lukewarm water acts on the parasympathetic nerves and relaxes the body. We recommend that when you are tired, bathe in lukewarm water, and in the morning before being active, bathe in hot water. Unzen Style Bathing　What should you do before getting into the bath? What kind of bathing is good for you? Before bathing in the hot spring, pour bathwater over yourself. Before bathing, to encourage perspiration, please stay hydrated. Pour bathwater over yourself from your toes and fingers to ease yourself into the hot water. It is important to pour bathwater over yourself to prevent from getting dizzy by allowing the blood vessels in the skin to expand. Bathe up to your shoulders in the hot spring. Bathe up to your shoulders in the hot spring, and take in the hot spring's ingredients. Aside from having a sterilizing effect, sulfate ion expands blood vessels and prevents hardening of the arteries, and strengthens joints and tendons. Furthermore, sulfur activates the pancreas, and the perspiration caused by the hyperthermic effect prevents diabetes as well. It also has anti-stress properties, and is suitable for medical treatment. However, for those with high blood pressure, we recommend a half-body bath up to the belly button. Lukewarm (About 40°) water is ideal. When they were children, there are perhaps many people who were told that they have to stay in the bathtub until they count to 100. Because of this, it is often mistakenly thought that it is better to bathe long in hot water because your body is warmed up. However, bathing for extended periods in hot water can acutely increase blood pressure and heart rate, making it dangerous. If it is lukewarm water, long baths are safe. A good indication of this is to bathe until your forehead is slightly perspiring. When you feel the perspiration, take a break by getting out of the bathtub. You do not have to shower before getting out. The effects of hot springs last for about 3 hours, so it is actually more effective not to rinse off before getting out. However, because Unzen hot springs are sulfuric and strongly acidic, those with sensitive skin should rinse off with fresh water. After bathing, take half an hour to rest. After bathing, even if you feel refreshed, your body is more tired than you think. It takes about 2 to 3 hours until your blood pressure stabilizes, so take about half an hour to stay calm and be mindful of not getting chilly. Don't forget to hydrate yourself after perspiring. Furthermore, just because you have come to a hot spring resort, doesn't mean that you should bathe excessively. In fact, excessive bathing can strain the body and cause fatigue. Keep the number of baths to about 3 a day.